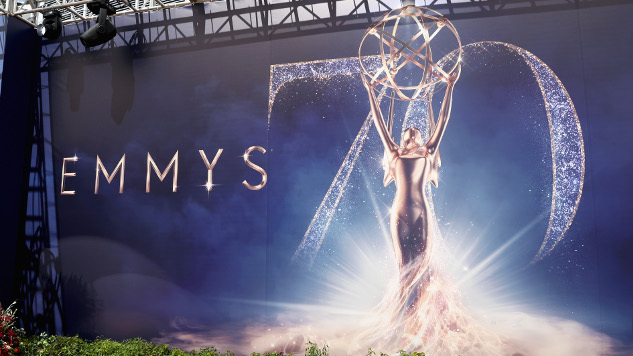 HBO’s world-conquering epic Game of Thrones seized the Outstanding Drama Series prize for the third time at the 70th Emmys on Monday night, having won twice consecutively before Hulu’s dystopian The Handmaid’s Tale took home the trophy last year. Handmaid’s and critical favorite Atlanta, both previous winners, were shut out altogether in the surprising grab-bag of this year’s winners, although Atlanta’s Teddy Perkins did make a creepy surprise appearance at the ceremony. Saturday Night Live’s Weekend Update hosts Michael Che and Colin Jost hosted the ceremony, and the show also picked up an expected win in the variety sketch series category. FX’s The Americans picked up two prizes for “START,” the series finale of its excellent, long-undervalued run, for lead actor Matthew Rhys and creators Joel Fields and Joe Weisberg in writing. In reality, RuPaul’s Drag Race won the top prize for the first time. Meanwhile, in comedy, Amazon’s The Marvelous Mrs. Maisel took advantage of repeat winner Veep’s absence and triumphed over pegged favorite Atlanta to win the top prize, plus awards for star Rachel Brosnahan, writing and directing for creator Amy Sherman-Palladino, and Alex Borstein in supporting. In limited series and TV movie, FX’s The Assassination Of Gianni Versace: American Crime Story won big, while Regina King pulled off an upset win for Netflix’s Seven Seconds, triumphing over Laura Dern in HBO’s The Tale. And the great Henry Winkler won a supporting actor award for his turn in Barry, his first Emmy win more than four decades after he was first nominated for his iconic Happy Days role in 1976. Read the full list of winners (in bold) below and measure them against Paste’s predictions here.